I joined News Corp Australia six months ago (and boy, that time has flown), spending the first eight or so weeks meeting literally hundreds of people across a variety of locations, hearing about our multitude of products and generally absorbing as much as possible. One of my observations from this time was that we had great people, but that they were too fractured - project teams were quite disparate, and although they were often facing similar issues, they didn’t have the relationships and networks to share their experiences and knowledge, and thus we were solving the same problems in different ways at different times. In time I accumulated a list of a few things to help with, and a chief one was fostering connections across teams and functions. But in a busy and large media organisation, driven by major events and deadlines, how do you build in time to create these important cross functional relationships? Separately, I also believed we should work to inspire our people too, and help them see what they were capable of. In discussion with our Head of Innovation, Mark Drasutis, we talked about running a “hack day” to loosen everyone up a bit from the constraints of day to day work. For Mark’s role, it would also be a key signal of our intentions around fostering innovation. Mark and I share many common philosophies around innovation and organisations, and our conversations were always full of energy. After a couple of false starts (coordinating over a hundred people across a dozen projects is tricky!) and with great executive level support, we managed to find a date and with the help of friends at Fishburners set about planning for an epic innovation event: #NewsFoundry54 was born! There were a few concerns: would we get everything planned in time? Would we be able to excite everyone into participation? Would the event and results be compelling enough that we’d get the chance to do it again? Could we make it amazing? Well, I’m happy to report that the event was a tremendous succcess. While we had a slow lead up, when we reached the kickoff day the groundswell of action and support was phenomenal. Over 54 hours, from midday on Wednesday to late Friday we had a frenzy of activity with over 100 participants and a lot of additional help on top of it. Great digital creativity by 19 News Corp Australia teams during Hackathon today in Sydney: #newsfoundry54! Well done, News Corp (I judged)! and more at the “#NewsFoundry54” hashtag. Firstly, we absolutely couldn’t have done this without the help of Peter Bradd from Fishburners. Both Mark and I had hectic regular day jobs to attend to, and while we’d each run innovation events before, Peter had run over half a dozen of these for a variety of organisations over the past three years, so his expertise and availability were invaluable. Also a special mention for Daphne Hazelhoff-Need who was crucial in coordinating and navigating the organisation. Decide on who to involve - News Corp Australia is a busy media organisation with thousands of employees - who would want to be participate? Who could spare the time? We had good discussion on how to reward winners, and in the end we decided we would donate to charity on behalf of every participant. For me this was a good move, since while prizes or rewards are nice, I wanted to avoid a “punished by rewards” situation, and appeal to people’s intrinsic motivation. Some distance between planning meetings and the actual event turned out to be useful - it gave people the chance to build relationships, explore ideas and plan an approach. Having everyone in the same space was important - the energy concentrated in that part of the building was immense, and getting people away from their regular workspaces and mindsets was important. As a side note: this required some fast work from our infrastructure team to provide enough wireless access points. The volunteers on the help desk were lifesavers - they weren’t busy all the time, but having people there to answer questions was priceless. Gaining executive level support, including half a dozen of the most senior people in the company as judges of the finale turned this from a sideshow to a focus and has built support for ensuing events. T-shirts! Custom t-shirts printed in a variety of colours gave the event a vibrant flavour… the only problem was that we didn’t get enough of them! The challenge of carrying over the mindset and energy from this event to everyone’s normal working life is a tricky one - there’s so much to love about the innovative approach, but is it really practical or sustainable to work like this all the time? No, but we did encourage people to think about how they could alter their regular approach. Flexibility with the “deliverable” - originally we’d stipulated “no Powerpoint” and “must be working code”, but the truth is that our teams were a mix of programmers, product people, marketers, sales and editorial – and only some of those could write code. The other groups also have valuable contributions, and sometimes that meant building Powerpoint slides to show business models etc. Documenting the experience via Twitter hashtag #NewsFoundry54 means we’ve got a record of (some) of the event. Hopefully next time more people see the value of adding their voice on social media. Ensuring our technology participation is inclusive – we didn’t do a good job of making some areas feel welcome. For instance, our technology t-shirts actually said “Developer” on the back, when it really should have said “Technology”. Making sure technology factors, especially proxies and firewalls, are sorted out before the event. Even with warnings and advice, too many people lost time trying to get their setup working. Having said that, we had some success with Red Hat’s OpenShift PaaS offering to help get things going more quickly. Thanks to our operations team and Red Hat for help with that. Perhaps having a better plan for an “after party”. After all the effort, many of us collapsed down to a nearby pub, but a bunch of people got lost and it while those who made it had a blast celebrating to the early hours, it was a bit of an afterthought. 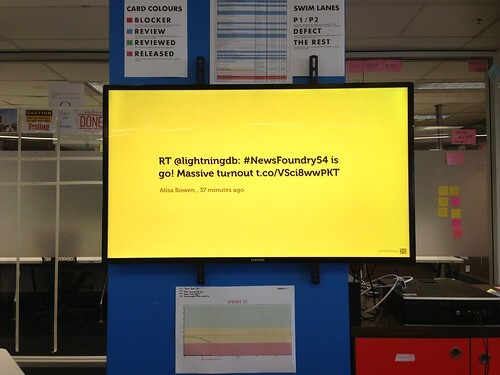 Ultimately NewsFoundry54 was a thrilling and exciting ride that I am very proud to have been a part of. The ideas and execution were the stars of the show, but the sense of shared purpose, the collaboration, the sharing and the excitement were just as notable. While innovation and startup events are not necessarily new in the cutting edge tech communities around, they are still significantly unknown for a lot of people in large organisations, and as such it can be a challenge to explain what they can do for a company. Now, everyone in News Corp knows - they were either there to experience it directly or have heard about it through the grapevine, and we’ve already seen great carryover into everyday work. Yes, this is an event that will be reprised, and I can barely wait for the next one!